gnome 3.8 | Unity and Ubuntu – Tweaks you must know! Ubuntu 13.04 ships with an older version of the GNOME desktop in its archives. This is great for GNOME-fans wanting stability, less great for those wanting to try the latest release. Thankfully the GNOME team make it easy to install/upgrade to GNOME 3.8 on Ubuntu 13.04 – and there are plenty of reasons why you might want to do that! There are caveats aplenty – largely that some of the software is a little unstable – but chances are if you’re competent enough to upgrade your desktop you’re also okay to deal with whatever issues might arise. Before you skim-read any further make sure that you’re running Ubuntu 13.04. Y’know, the latest release. Better yet, run Ubuntu GNOME 13.04. With that out-of-the-way, we’ll first add the GNOME 3 PPA to Ubuntu’s Software Sources. This can be done without using the command line but, for simplicity’s sake, it’s far easier to do so. Open a new Terminal window and enter the following command carefully. With the PPA added, you now need to do one of two steps depending on what you have installed. Both of these options will let you choose a session before logging on (so you can log in to Unity if you so wish). ‘lightdm’ is the Ubuntu default, but for a true GNOME experience, such as getting lock-screen notifications, you’ll want to opt for the GNOME Display Manager (known as GDM). If you feel super cautious you can also add the GNOME 3 Staging PPA. But – and it’s a big but that you must pay attention to – many components within it are unstable. That’s it – you’re all done. The make sure everything goes as smoothly as possible you’ll want to reboot. If you’re using the Unity’s default login screen click the Ubuntu logo in the user pod, choose the ‘GNOME’ session, then go ahead and login as normal. If you chose the GNOME display manager then choose ‘GNOME’ from the session drop-down before logging in. Some differences to note when using GNOME Shell alongside Unity. Firstly, you’ll see two ‘online accounts’ entries in System Settings. The left-hand one is Ubuntu’s fork. The right-hand is the GNOME version. For integration with certain GNOME apps, including Documents, Contacts & Evolution and Calendar you’ll want to add your accounts to the right-hand version. For Shotwell, Empathy & Gwibber support you’ll need to use the left-hand version. Also ‘new’ in System Settings are entries for ‘Notifications’ and ‘Search’. Both are self-explanatory; the former lets you pick which apps can send notifications, while the latter concerns which applications/sources show results in the Activities Overlay. To uninstall the GNOME Shell desktop we need to do a few things. Clear up any remaining stray applications not removed by the downgrade and removal, then reboot. How To Upgrade to GNOME 3.8 in Ubuntu 13.04 OMG! Ubuntu! – Everything Ubuntu. Daily. This entry was posted in gnome, gnome 3.8, How To, Pro User, raring ringtail on April 28, 2013 by unityadmin. Following on from its release last week, GNOME’s default web-browser is now available for users of Ubuntu 13.04 to install. The aptly-titled Web, is a lightweight webkit browser built using GNOME technologies and designed specifically for the GNOME desktop. Ubuntu GNOME 13.04 users can install the release from the GNOME PPAs, both of which also upgrade the stock GNOME 3.6 desktop to GNOME 3.8. Despite being the default web-browser in GNOME few GNOME-using distributions actually ship with it by default. Ubuntu GNOME, Fedora and OpenSuSE instead provide Firefox to their users. That’s understandable: Firefox is a power-house of a name. But just because Web is a less well known doesn’t mean that it’s less useful. In fact, it’s rather charming. The minimal gives less room to excessive options and more room to web-pages, and if you can live without add-ons, themes and extensions, you’ll find it can do just about anything other browsers can. But what’s new in Web 3.8 specifically? Quite a fair bit. A private browsing mode has been added, letting you tip-toe around the web without leaving a trace. To go ‘Incognito’ just click the Web app menu and select ‘New Incognito Window’. Another user-experience tweak – and one many will be incredibly pleased to see arrive – is the arrival of a ‘New Tab’ button in the application toolbar. I sorely missed having this accessible in previous versions. Adobe’s Flash plugin is now supported natively. Just install the Adobe Flash Plugin installer package from the Ubuntu Software Center and Web will do the rest. In stock, freshly installed Ubuntu GNOME you can install the previous version of Web, version 3.6, straight from the Ubuntu Software Center. But for this newer, more featured and more stable release you’ll need to add the following GNOME Team PPA. It’s important that you’re aware that adding this will also upgrade the rest of your desktop to GNOME 3.8. 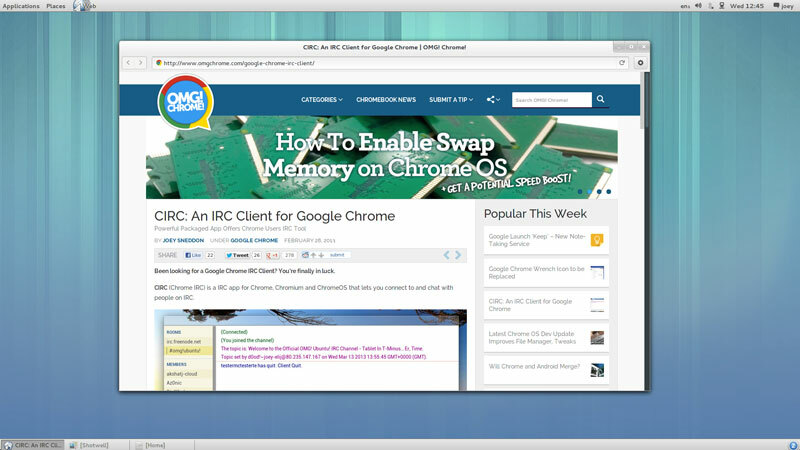 Latest Release of GNOME Web Browser Available for Ubuntu 13.04 Users OMG! Ubuntu! – Everything Ubuntu. Daily. This entry was posted in App, Download, epiphany, gnome, gnome 3.8, gnome web on April 5, 2013 by unityadmin. GNOME 3.8, the latest version of the popular free desktop environment, has been released. The fourth major update to the GNOME 3.x line, GNOME 3.8 brings many new features and functionality to its users, including enhanced applications and a focus on privacy. We listed 10 of our favourite new features in this release earlier today – go check them out. For more information on the release be sure to check out the official release notes. The bad news is that getting GNOME 3.8 in Ubuntu isn’t easy. Ubuntu 13.04 ships with GNOME 3.6 by default, the same version as available in Ubuntu 12.10. The good news is that much of the desktop can be upgraded to version 3.8 by adding the additional GNOME PPAs. But if you’re using a release prior to that it’s unlikely that GNOME 3.8 will be ported backwards. This entry was posted in gnome, gnome 3.8, News on March 27, 2013 by unityadmin. The latest iteration of the popular GNOME desktop, version 3.8, sees release today – but what are notable changes and improvements should you be looking out for? Here’s a list of our 10 favourite changes – in no specific order – new to this release. Opening apps in GNOME Shell has always been easy to do, but tweaks to the Application Overlay in this latest release makes it even quicker still. When viewing the Application Overlay you’ll now find two tabs at the bottom – ‘Frequent Apps’ and ‘All’. ‘Frequent’ groups your most used apps together in one page, meaning you don’t have to go search them out or remember to pin them to the launcher. ‘All’, meanwhile, shows all your installed apps, including new ‘groups’ of apps. 3.8 brings two new application ‘previews’ to the desktop – a desktop weather app called ‘Weather’ (imagine that, eh!) and a new note-taking app called ‘Bijiben’. 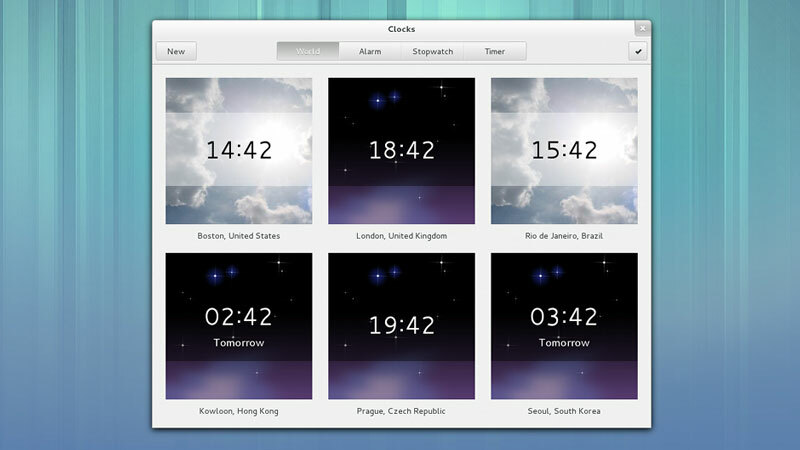 ‘Clocks’ is another new app on the GNOME desktop. Now stable and included as a default application in this latest release, Clocks allows you to add and preview world times, add alarms, and make use of a stopwatch and a timer. No run-down of notable new stuff would be complete without mention of the raft of minor but vital ‘papercut’ fixes that the GNOME team have been dutifully seeing to during this cycle. Over 60 such bugs have been fixed, new animations introduced, and usability problems solved. Privacy is a hot potato topic on the Linux desktop right now. Ubuntu has included a range of configurable Privacy settings in its last few releases, but it’s only with 3.8 that GNOME follows suit. Options for adjusting what appears on the lock screen; what activity is tracked; and how long temporary files are kept around for can all be accessed behind the new Privacy tile in Settings. ‘Documents’, the default document management app on the GNOME desktop, gains a number of interace tweaks this release – as well as some seriously cool Google Docs/Drive integration. The Activities Overview has given its search results view a bit of an overhaul, with application-specific search results displayed. Don’t want ‘Documents’ appearing? Turn it off. Want files and folders to appear first? Move them to the top. Miss the ‘panel up, panel down’ desktop layout of old? GNOME 3.8 has you covered with their new Classic mode. The best thing about Classic mode is that it’s wholesome GNOME. It’s not a fork but built with GNOME 3 technologies – so you’re don’t lose out on any of GNOME’s great features. Everything from the App Menus and the Message Center to the GNOME Shell activities overlay are included and accessible. Furthermore, a new Notifications Settings pane allows you to choose which apps show notifications, what sort of notifications they show, and where. Handy stuff! This entry was posted in gnome, gnome 3.8, List, News on March 27, 2013 by unityadmin.